Last year’s Dodgers bullpen piled up Ks at a historic rate. Los Angeles relievers averaged 10.24 strikeouts per nine innings last season, the best mark of the live ball era in the National League. Their record might not even last a full season. 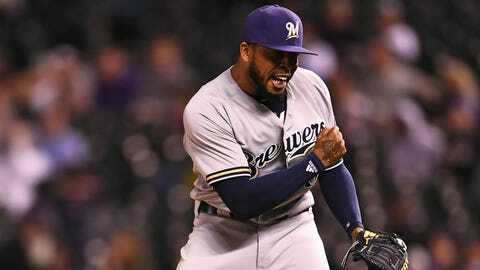 Led by All-Stars Jeremy Jeffress and Josh Hader, the Brewers‘ bullpen entered their series with the Dodgers averaging 10.17 strikeouts per nine innings, just off the Dodgers’ record. They were at it again Monday. Hader, Jeffress, Knebel and Joakim Soria (acquired from the Chicago White Sox) allowed just one run on two hits the rest of the way after starter Freddy Peralta exited after four innings. They fanned seven combined, inching a bit closer to the Dodgers’ mark. They’ve been the class of the National League this season, matched only by the Pittsburgh Pirates, who sit at an even 10 — the Dodgers have sunk to 9.47 — but trail the American League leaders, the Houston Astros and New York Yankees.